Learn what social media trends are developing in 2015 and how to use them to improve your social media marketing strategies. One of the beauties of social media is its ability to change at a rapid speed to fit consumer needs. It's important to look back to see how social media changed in 2014 in order to better understand what developing trends lie ahead in the new year. After reviewing 2014’s social media advances, there were four major trends developing for social media marketing in 2015. It’s getting harder and harder to grab the attention of our audiences with the overwhelming amount of platforms and ways to receive information. It’s crucial to make social posts as engaging as possible, and there’s no denying the statistics behind the power of visual content. 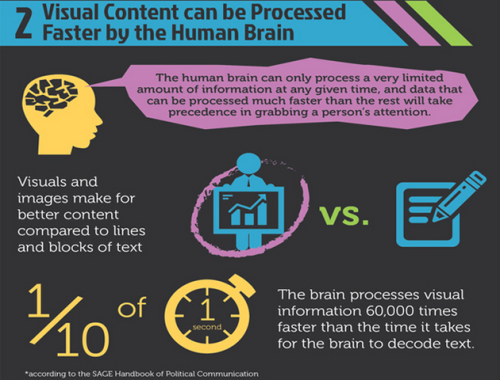 Studies have shown that “90% of information transmitted to the brain is visual,” and information is “processed 60,000 times faster in that brain than text.” In 2015 it will be crucial to use the art of storytelling through imagery, audio, video and infographics to engage with audiences. Click the image to see the rest of HubSpot's 12 Reasons to Integrate Visual Content Into Your Marketing Campaigns Infographic. Content like vlogs capture viewer attention through visuals as well as audio, and stand out from regular text. It’s no surprise to see that Instagram, a mobile social app known for its video and photo sharing, has over 300 million active users. Although video content will have increased availability on other channels, don’t assume YouTube will start to go away anytime soon. With YouTube having over 1 billion unique monthly visitors, it’s still one of the largest active video marketing platforms. 2014 was THE year of video marketing, and for a majority of it YouTube dominated the field. While many companies and brands rushed to join YouTube (and will continue to do so in 2015), it is not the only source for video marketing anymore. With the recent developments and popularity of video apps like Vine, Snapchat and Instagram, short video content is no longer reserved to just YouTube. Social networks hosting video on their own platforms will help increase engagement, keeping users on their site for longer periods of time and helping marketers utilize platforms for niche marketing strategies. 3) Social Media eCommerce is developing! The ability to shop through social media is changing from a daydream to a reality as Twitter and Facebook begin beta testing ‘Buy Now’ buttons. What was merely an idea in 2014 is turning into a reality in 2015. It’s not just with Twitter and Facebook: on Instagram selective big brands are testing the capability of shopping through developed platforms like Like2Buy. Like2Buy allows users to like products on Instagram and go to the link in their profile to purchase them, thus bridging the gap between Instagram and marketing to boost sales. Big brands like Nordstrom are currently testing Like2Buy. While it may only be a small market testing direct buying on a few social media platforms, this could become a major source for shopping in 2015 and evolve the eCommerce game. Speaking of using visual content to improve engagement, SlideShare is becoming a key social network for business professional to learn in a visual form. It's a great resource to design, distribute and digest content for a variety of audiences from different industries. SlideShare gives you the necessary tools for repurposing old content to add a visual storytelling approach that engages viewers and makes it sharable. It's an ideal way to drive page views and evergreen content. If that wasn't enough, SlideShare is also looking to extend video capabilities sometime in 2015. With SlideShare being known for its educational content, the addition of video could easily make this platform the YouTube for business! What other social media trends do you see shaping the way we market in 2015? Share your thoughts in the comments section. Interested in learning more about how we develop our social media strategies? Reach out and contact us today! We’d love to hear from you.